CorkWay Store | The largest Cork Store in the Web Is Now Open! 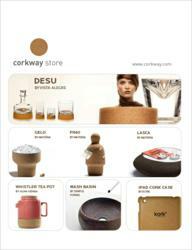 Shop for Cork Products! The CorkWay Store (http://www.corkway.com) is the largest online store specialized in the commercialization of cork products. With an extensive catalogue of the best and finest cork products, the CorkWay Store is being positioned as the top cork store worldwide. The CorkWay Store hereby informs all Media and related institutions about its official launch. Cork has been used as an innovative material in brands such as Amorim, VistaAlegre, Materia, Simple Forms and more. In CorkWay Store can be found 100% natural cork products, as well as various innovative and successful combinations such as with china porcelain, crystal and ceramics. The highlights of our store are the cork collection of Normann Copenhagen, Desu Vista Alegre Atlantis collection, the iPad cork cover by Aprodukt , the cork wash basin by SimpleForms, the Cocktail Set by Miranda Watkins, the Whistler tea pot Alma Gémea, and the latest collection of Materia curated by Experimenta. In addition to all this the CorkWay Store is launching a social responsibility campaign ( Plant a tree ) in which, for every product sold, or for every fan on CorkWay Facebook page, a tree will be planted, in partnership with the Green Cork Project of Quercus.